GPS Location Tracker is designed to make it super easy to share locations with friends and family. 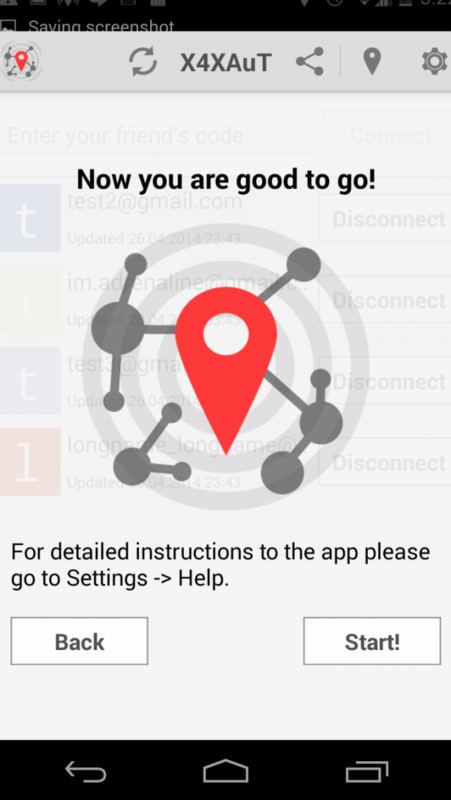 GPS Location Tracker requires no registration and is completely free and secure! How to use GPS Location Tracker? Each app user has their own connection code. 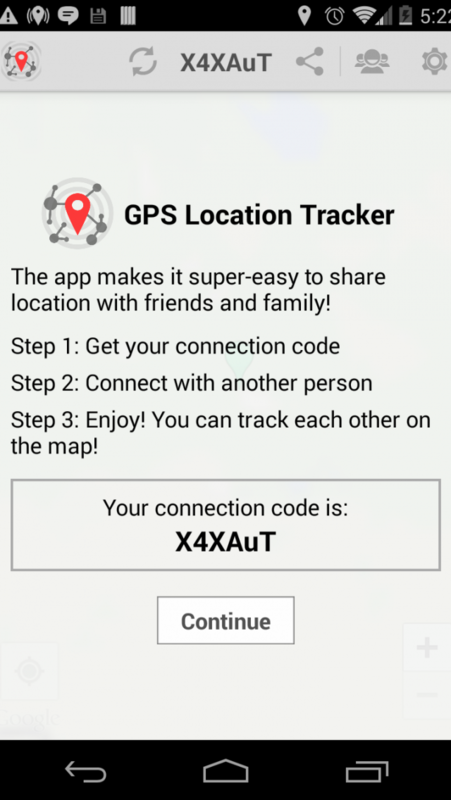 To start sharing each others location with someone you should either give them your code or get their code and enter it into GPS Location Tracker. I received code from friend. What should I do next? How to send my code to someone? How does GPS Location Tracker work? You and your friends connect by the means of unique “connection code” as described above. Once you are connected you can see each other’s location updates on the map. If a friend added you and after that you will try to add him, don’t worry, you won’t get any duplicate connections. Note that your Google Account e-mail is used to identify you in your friends’ Connections lists. It means that you will see each other’s e-mails. GPS Location Tracker’s accuracy of detecting your location may depend on whether GPS, Wi-Fi or Mobile internet is On on your device. Also, GPS tracking requires Location Services running - it will alert you on application start if the service is not running. To sync GPS tracking results and receive updates GPS Location tracker uses internet. How to quickly navigate to a friend’s location? Tap on your friend in the connections list. 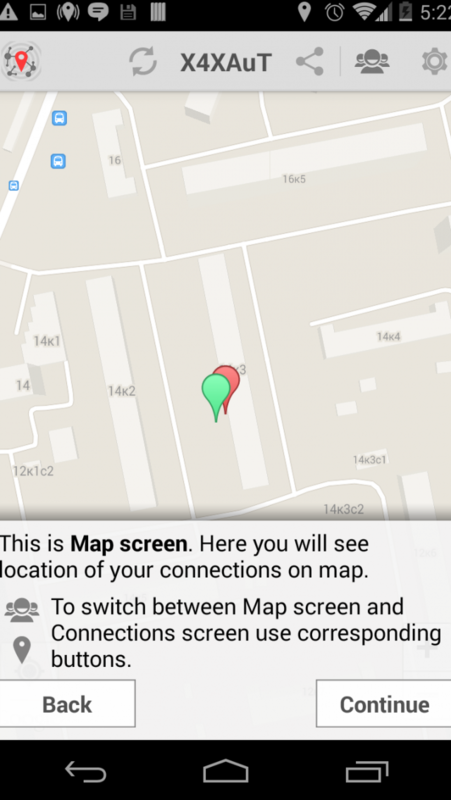 The map will open and zoom to the person’s location. You can tap on a marker on the map to see who it belongs to. I don’t feel like sharing my location at all, what should I do? 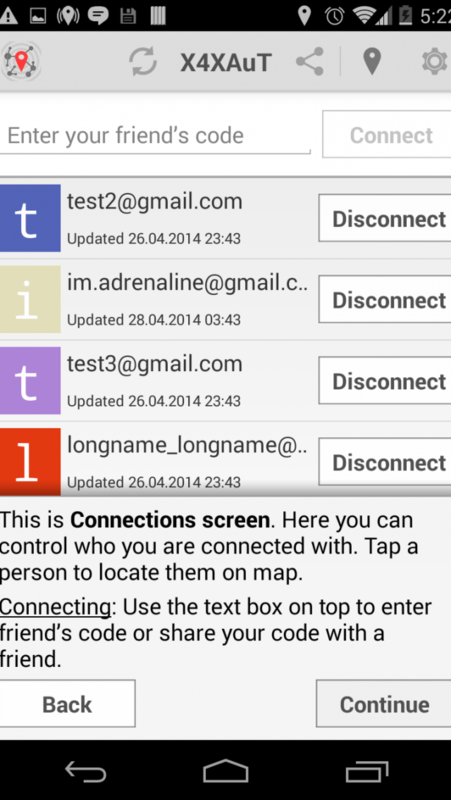 Open GPS Location Tracker, go to Settings and switch Location sharing off - this will stop GPS tracking. Your friends will not see if your location changes, but you will still receive location updates from them. What if I don’t want to be connected with someone anymore? Go to the list and hit the Disconnect button next to the undesirable person! In case they know your current code they can connect to you again. To avoid it you can change the code by hitting Refresh in the menu. Don’t worry about your current connections: changing code will not affect them. and user friendly than any other location tracker. What is most important in the GPS Location Tracker is that it requires no registration at all and it is completely free to use! Please, don't down vote GPS Location Tracker! It is fresh app and it might contain some bugs. Write me to triladroid@gmail.com and everything will be fixed as soon as possible!